Currently under construction at Wim van der Valk Yachts, the 26 metre motor yacht Continental III model is a collaboration between the shipyard and Guido de Groot Design. She was specifically created to sail and operate with a crew, providing her guests on board the maximum privacy. Guido de Groot Design worked closely together with her client to create her modern looks and spacious interior layout. 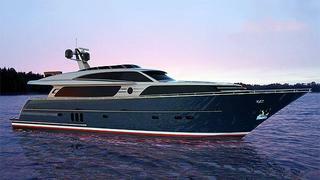 Continental III will be equipped with many special features such as a triple Volvo Penta IPS-1200 drive system, a Seakeeper M26000 Gyro stabilizing system, state-of-the-art ship management, navigation, night vision and entertainment systems. Construction is well underway and delivery is scheduled for August 2013.